Translating technical texts certainly requires familiarity with the subject and its specific terminology as well as the capacity to see things from your perspective. In any case, these are the standards I set myself as a translator. Should I lack some specific detail, I have access to sources of information, and to an extended network of specialized colleagues. If in your text I come across ambiguities or inconsistencies or if I miss certain information, I'll contact you. To be sure, I don't accept jobs outside my capability. I'll meet deadlines or deliver early just as you will pay your invoice on time. A precise agreement and easy communication are for me the sine qua nons of a fruitful cooperation. For me, each translation is an individual piece of craftsmanship, result of a process that sometimes can be supported, but never replaced by a gadget or a program. To the extent that I make use of electronic tools, they are just aids for manual translation. Notwithstanding, the management of terminology is an important part of my work. Craftsmanship implies custom work. Not only the text genres differ in their requirements on terminology, style etcetera; often this is applicable to each individual author. If an author has a specific style this should be reflected in the translation. Additional services: If required, I will format your translation in a professional layout and deliver it as PDF file ready to print. 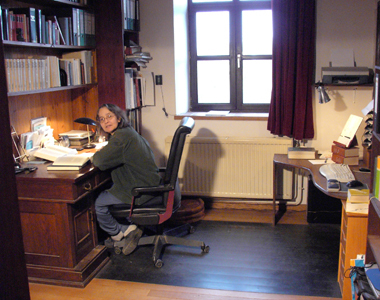 You can also resort to me for proofreading, text correction and editing of Dutch and German texts .